The Air Force carried out “mock raids” over Lebanon, hours after Israel downed a drone, Lebanese media report. TV: Hizbullah launched it. A Lebanese television station stated that Hizbullah was responsible for the drone infiltration into Israel’s air space, while Iran’s propaganda machine tried to divert attention from Hizbullah and claim the drone Israel downed was mistakenly launched by the United States. 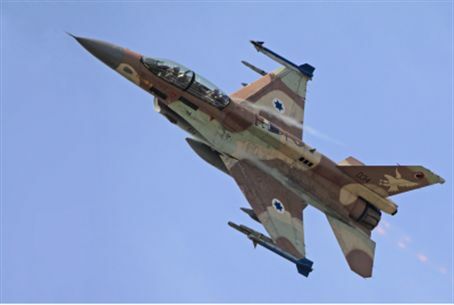 Hizbullah has not officially commented on the drone, which was destroyed by Israeli Air Force F-16 jets Saturday morning over a relatively unpopulated area. However, Al-Mayadeen television, linked with Hizbullah, said the terrorist group launched the drone, which “traveled 100 kilometers deep inside Israel and sparked tensions." Iran’s government-controlled Press TV told Iranians that a former Lebanese general said that drone actually was mistakenly fired by the United States. The Ahmadinejad regime frequently tried to take the focus off accusations against Iran or its allies by blaming others for terrorist attacks. “[The drone must have come] from an American aircraft carrier or from [air force and military bases in] Saudi Arabia, also American bases. That’s the only possibility so far until we know after investigation,” said retired Lebanese major general Hisham Jaber in an interview with the Iranian media outlet. “Jaber maintained that although the Tel Aviv regime might accuse an Arab state, it was unlikely that the drone belonged to an Arab country,” Press TV reported. “Considering the good relationship between the Israeli regime and Jordan, the analyst went on to say that he did not think the drone could have been operated from Jordan, adding that it is ‘impossible’ that the drone came from Lebanon,” it added. “If Israel after investigation will remain silent and will close the file that means like we said it came from friendly side (mistakenly sent by the Americans) and it is not in their interest to talk about it,” Jaber concluded.